Overview - A young boy named Milo gains a deeper appreciation for his mom after Martians come to Earth to take her away. It's been around for years now, and shows no signs of going anywhere, but to be honest, I'm still not quite sure what to make of motion capture animation. On the one hand, I usually like to embrace new innovations and developments in filmmaking, and no matter how gimmicky, unnecessary, or potentially damaging they might seem, I try to remember that there was a time when people said the same thing about sound and color. Still, there's something about the awkward, often creepy results of fully animated motion capture offerings that haven't really sold me on the concept just yet. The whole point seems to be to combine the natural movements and authentic performances of live action efforts, with the limitless possibilities of animation, but for some reason, most examples of the technology end up seeming less natural, fluid, and imaginative than traditional hand drawn and CG films. So, this all brings us to the actual movie in question, 'Mars Needs Mom,' the latest motion capture effort from producer Robert Zemeckis. Directed by Simon Wells, the film unfortunately does little to change my mind about this still evolving technology, and what we get here is a sometimes creepy, unimaginative, bleak, and stiff movie that despite its many flaws still manages to scrounge up some occasional bursts of entertainment and excitement. Based on the picture book written by Berkeley Breathed, the film follows a young boy, Milo (Seth Green, though his vocal performance was later dubbed over by Seth Dusky), whose mother (Joan Cusack) is abducted by Martians. The aliens wish to extract her disciplinary knowledge in order to program an army of child rearing robots that will raise the female Martian children. Of course, once the extraction is complete, dear old mom will get destroyed. Milo ends up hitching a ride with the abducting aliens and embarks on an adventure to save his mother before it's too late. The plot is rather simple, but on the surface seems like it could still make a great basis for a movie. The idea is ripe for development and the mother-child relationship is one almost everyone can relate to. Throw in some cool aliens and the possibilities for creative storytelling are all there. Disappointingly, that's just not what we get. One of the key downfalls of the film is a lack of character development. Milo himself is simply a generic little boy, with no real defining qualities, and while both Seths do a decent job in the role, they don’t have a lot to work with. We don't really get to know him and his mother much before the plot kicks into gear, and while yes, we can pretty much infer what their relationship is like based on what we all know about mothers and sons, the reality is that the unique quirks and specific traits of their personal connection to one another is what would have made the movie resonate, and by downplaying that, 'Mars Needs Moms' does a great disservice to itself. Despite a core emotional story, much of the film ends up lacking substantial heart. With that said, the climax is handled well, and one key moment is a perfectly realized encapsulation of what it means to be a mother. I just wish the rest of the movie worked as strongly. With a premise like this, one might expect a certain air of whimsy and wonder, but those traits are nowhere to be found, instead replaced with generic banality. On this same note, the plot can actually be rather dark in content, and while I'm usually all for pushing the boundaries in children's entertainment and for resisting the urge to sanitize harsher elements, here the gloomy aspects just sort of feel hollow. There is some attempt to inject some personality into the proceedings with the supporting cast that aids Milo, including a now grown former child abductee who called himself Gribble (Dan Foggler) and a graffiti artist Martian named Ki (Elisabeth Harnois), but again, despite decent performances, these characters all feel rather tired and unoriginal, and their attempts at humor mostly fall flat. The Martians in general are also fairly uninteresting and while the core of the concept, dealing with a culture that no longer uses parents, is interesting, the execution of the idea is undeveloped and muddled. The movie sort of just goes through the motions of the plot, moving from one action set-piece to the next, and since we have little actual affinity for any of the characters, these scenes lack emotional investment. With that said, from a purely technical standpoint, the staging and animation for these action sequences is well done, and there is definitely some entertainment value to be found in them. Outside of the big action scenes, the animation itself is a mixed bag. Some sequences and shots look rather stunning, bringing a colorful and creative world to life, but the vast majority of the visual style is actually rather drab and uninteresting. Character movements are sometime lifelike and natural, but can often seem stiff and awkward, especially with joints like elbows and knees. Facial expressions are nicely captured from the performers, but like many films of this type, the lifeless eyes of these CG creations are just plain creepy, reminding us again that we have yet to truly make it out of the uncanny valley. I understand that this is a picture geared toward children, but that doesn't excuse it from its many shortcomings. When done right, family entertainment can be exceptional, working on multiple levels to spark the imagination and ignite the youthful spirit in all our hearts. Though not terrible, 'Mars Needs Moms' does not accomplish that goal. It lacks substantial magic and heart, two key ingredients, and while the technology is impressive, the animation itself just can't compete with what other studios are doing. It has some redeeming qualities, but there are so many better, similar efforts that it makes it very hard to recommend. 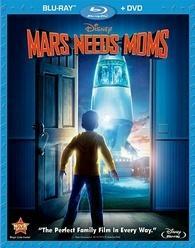 Disney presents 'Mars Needs Moms' in a Blu-ray/DVD Combo Pack. The film is provided on a single BD-50 disc housed in a standard case along with a DVD copy. A menu activates upon startup, asking the user to choose a language between English, English DVS, French, Spanish, or Portuguese. Some skippable trailers then play before transitioning to a standard navigation menu. The packaging indicates the disc is region A,B, and C compatible. The movie is provided with a 1080p/AVC MPEG-4 transfer in the 2.40:1 aspect ratio. Like most CG animated films, the video is pristine and very impressive. The digital source is essentially perfect, with no real signs of artifacting or banding. Detail is excellent, showing off the intricate design work done by the animators. Everything from the high-tech space ships and computer consoles, to the rock formations of Mars and the expressions on the characters themselves, are all realized with sometimes startling clarity. A later scene in a Martian cavern, filled with glowing, vibrant painted walls and shimmering water, is particularly impressive. Colors are rich and nicely saturated, though the film can be a bit dark and drab in appearance, echoing the more rigid and disciplinary society of the Martian people. Black levels are deep and inky and contrast is strong leading to several instances of eye catching pop. Though this is the 2D version of the movie, the compositions and movements are still designed for 3D, leading to several scenes which show off a great sense of layered dimensionality. 'Mars Needs Moms' is a fantastic looking disc that offers an impressive and visually pleasing experience. So, you may be asking, why didn't I give it a perfect score then? Well, despite the nearly immaculate presentation, I still don't quite feel this disc deserves to be in the top tier of video presentations. It looks great and there isn't anything in particular to complain about per say, but for me, it's lacking that extra special something in visual detail, pop, and dimensionality that would push it over the top into perfect score territory. The movie is presented in an English DTS-HD Master Audio 7.1 track, an English DVS Dolby Digital 2.0 track (for the visually impaired), and French, Spanish, and Portuguese Dolby Digital 5.1 tracks. Subtitle options include English, English SDH, French, Spanish, and Portuguese. Marked by an almost constant onslaught of enveloping effects and sound design, 'Mars Needs Moms' sounds absolutely amazing. Dialogue is crisp and full sounding with no pops or crackles. Directionality and surround use are almost non-stop, with the film's numerous action set-pieces leading right into the next. Rocket thrusters, laser blasts, clanking boots, screaming aliens, and a wide assortment of diverse effects envelope the soundstage in a lively display of aural delights. Bass is deep and strong, bringing a room shaking thud in several scenes. Dynamic range is wide, giving the film a complete assortment of frequencies that are all balanced well together within the mix. Though the video might be missing that extra little punch to push it over the edge, the audio has no such problem, with an exceptional, absolutely demo worthy track. Disney has included a small but decent collection of supplements including a Blu-ray exclusive commentary and picture-in-picture experience. All of the extras are presented in 1080p with Dolby Digital 2.0 audio and English, French, Spanish, and Portuguese subtitle options. Fun With Seth (HD, 2 min) - This is a quick behind-the-scenes look at actor Seth Green working on-set in his motion capture outfit. Interviews with the cast and crew are included spotlighting his comical antics and lively presence, including a quick look at a playful Velcro ninja star battle between Green and costar Dan Fogler. Martian 101 (HD, 3 min) - The made up Martian language used in the movie is the focus here, and the cast and crew talk about developing the fictional vocabulary. We even get to learn a few simple phrases, which I'm sure could end up being useful someday. Discover Blu-ray 3D with Timon and Pumbaa (HD, 4 min) - This is a brief promo for Disney 3D content, and features Timon and Pumbaa from 'The Lion King' extolling the virtues of the third dimension with some potentially cool demonstrations. Unfortunately this disc is the 2D only version of the film and thus this feature is of course only presented in 2D, making it pretty worthless. 'Mars Needs Moms' isn't a horrible film, but it lacks charm, imagination, and soul, in both content and animation. I know a lot of hard work went into the production, but it's just a shame that so little of it is apparent on screen. Motion capture tends to work best when blended with live action and on its own still seems to have a long ways to go. Still, the video quality is great, and the audio is fantastic. Supplements are a little light, but the included picture-in-picture commentary track is well worth your time. While I can't really recommend this as a purchase, it might not make a bad family rental.